and can share that EPROM file? Last edited by jxalex on Wed Dec 14, 2016 7:49 am, edited 1 time in total. Its a physical chip. As far as I know, it updates the clickiness you get from a tempo synced delay. There are ebay sellers offering v1.04 chips for about $60. 1.04 OS corrects an erroneous 'low voltage' warning which can occur prematurely and also corrects the audio response when modulating the depth, i.e., return, of delay effects. Finding a programmer that can write on a M27C802CZ might be a bit difficult. Yekuku wrote: 1.04 OS corrects an erroneous 'low voltage' warning which can occur prematurely and also corrects the audio response when modulating the depth, i.e., return, of delay effects. Really thats no problem. I guess that I need to introduce myself really. All I need is datasheet ... and a chip as I make many tools myself, including the programmers if needed when there is needed a 16-bit programmer. Even my ROland JD990 firmware v1.05 I programmed with my own custom programmer which I used to read out some other expansion cards. That datasheet is the most hard to find besides EPROM firmware files. Thank You. Sharing is caring. AND I have something to share too. It is a big help to these who want to replace or restaurate their PG800. just let me know, I have just some chips in spare in that 27C16...27C512 chips and one 16bit EPROM (which was for JD990). If anyone interested I am glad and happy to assist with these chips with just a chip price $1..2 depending on chip and $1..2 shipping price (I ship from Sweden). Thats really not a price for programming, just a price for chip itself. I see no need to get rich by EPROM burnings and I love sharing this synth passion. Gear: Roland SH-101, MC-202, TB-303, TR-606, JP-8000. 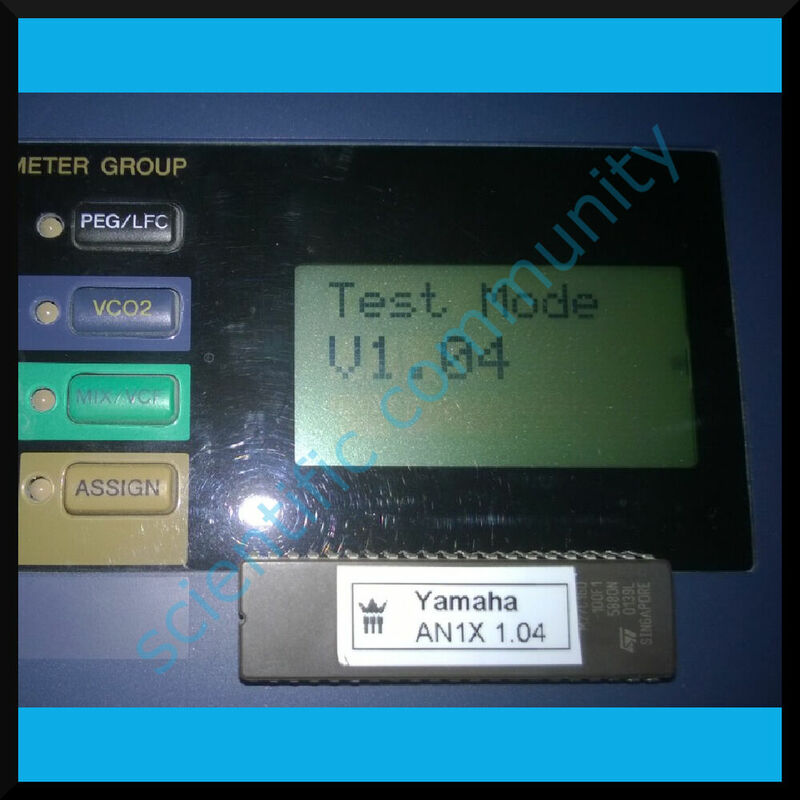 Yamaha AN1x, x0xb0x. Hello everybody. First post here, though I've lurked for many years. I just found this thread, would like to check if anyone can offer me a service to burn a v1.04 firmware EPROM chip for the AN1x? I've recently fallen in love with this synth again but the tempo delay clicks are driving me daft. ivaneranu wrote: just found this thread, would like to check if anyone can offer me a service to burn a v1.04 firmware EPROM chip for the AN1x? I'd PM jxalex for such things. I'm pretty sure he's willing to cheaply burn and post just about anywhere, provided he has the EPROM (which in this case, I believe he does). My other bit of advice is this: Keep giving back to the forum. Favor for a favor. Don't just drop off once you get your Yamaha updated. Nothing personal -- I don't know you well enough to be personal, clearly -- but my point is that the AN1X firmware is only available on this board because at least 4 people on VSE have worked to keep it in circulation. Does anyone know how I can check whether my AN1x has the 1.04 chip installed? I was not informed of any post-factory mods being done to it by the previous owner, but I've also never noticed any audible clicks when using tempoi synced delay. This thread has me curious. Kenneth wrote: Does anyone know how I can check whether my AN1x has the 1.04 chip installed? Press +,- and 0 while powering up. See my picture below, where you can see that the ebay seller used 27C160-10FI, which is much easier to find. My next concern is the image itself provided by Rasputin, we are talking 42 pin chips and they often require programming/burning over more “banks”. 27C800 = Programmed over 2 banks. 27C160 = Programmed over 4 banks. Rasputin provided only 1 image, for the Yamaha An1X. I´m sitting back with 1 question. Is the image duplicated on all the 2-4 banks? Note: There was difference between bank 1 and 2, when I made read-off from the Yamaha VL-70m eprom. teevee wrote: My next concern is the image itself provided by Rasputin, we are talking 42 pin chips and they often require programming/burning over more “banks”. If one is using an oversized EPROM then yes, the firmware is typically duplicated to fill the chip evenly. Any firmware being distributed should be left untouched as if writing to the original (stock capacity) EPROM. If one is competent enough to select another EPROM as a substitution then padding out the higher capacity should be trivial. Comparing the provided firmware image to the size of the original EPROM capacity should tell you whether or not it has been padded or not. I can't speak to the VL-70m EPROM. Could be garbage from a recycled EPROM, incorrect/random padding, or some other issue entirely. Yamaha used this oversized format in mores devices in this era (1998 – 2000) including A3000, SU-700 and FS1R. I don’t own a Yamaha An1x, but was it a eprom branded OTP Yamaha or M27C802? The MSM27C802CZ is a 8Mbit electrically Programmable Read-Only Memory whose configuration can be electrically switched between 524,288 word x 16bit and 1,048,576 word x 8bit. I need to compare the configuration with 27C160, but I find it interesting that it can switch between two sizes. I made copy of the firmware from my Yamaha VL-70m, which used a OTP chip branded Yamaha. I read-off as 27C160 and as 4 bank, if I only had read one side, then I would only have 50 % of the firmware as backup. 	https://www.dropbox.com/s/jjjoryf3h3cr9 ... m.zip?dl=0 < Bank (1+3) is identical and (2+4) is identical. I used a cheap eprom burner called “MiniPro TL866” and this is not able to automatically switch bank, this have to be done manually with settings. What eprom would you recommend as substitution for Yamaha An1X? teevee wrote: I made copy of the firmware from my Yamaha VL-70m, which used a OTP chip branded Yamaha. I read-off as 27C160 and as 4 bank, if I only had read one side, then I would only have 50 % of the firmware as backup. I don't know this for sure, but it could be a high and low byte image duplicated once to fill a double-sized EPROM. Are you the original owner? Do you have a picture of the EPROM in question?